To be sure, these are no small pink buds, rather they are grand and spectacular ones, there are in fact they are none other than Sweet Dolomiti Roses, famous for having so much charm, perhaps it is too much...exactly what one wants when seeking Wholesale Pink Roses. Class and elegance it a delightful blend that gives off a sense of innocence and richness, Marie Antoinette would be envious of these decadent blooms. She would probably miss the free delivery too...not that that was ever a concern of hers. This particular hue of pink is simply intoxicating, they are sure to be the talk of the town, the city, and nation. Rare is beauty like this ever experiences and so it is to be all the more treasured when being granted the pleasure to basque in it, to enjoy it with leisure and great appreciation. Hence we are certain that you will enjoy these magnificent florets! Allow the charm of fresh pink blossoms to capture and enhance the atmosphere on Mother's Day, a wedding day, anniversary party, or perhaps fundraiser. Everyone will feel generous and joyous around blooms that have so much to offer. Our wholesale prices are the best value for pink blossoms that you can find and with a quality guaranty, there is nothing to lose. 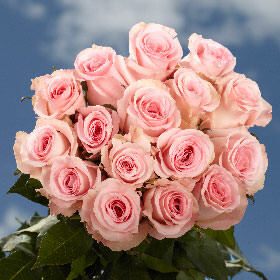 Indulge in Wholesale Pink Roses that will have everyone assuredly pleased and delighted. Fresh and blooming right before you, their unmistakable lineage and fine breeding is apparent upon seeing them, you know that your orders have been raised by loving and caring hands. That is what you should expect when ordering flowers, and we are happy to deliver it.